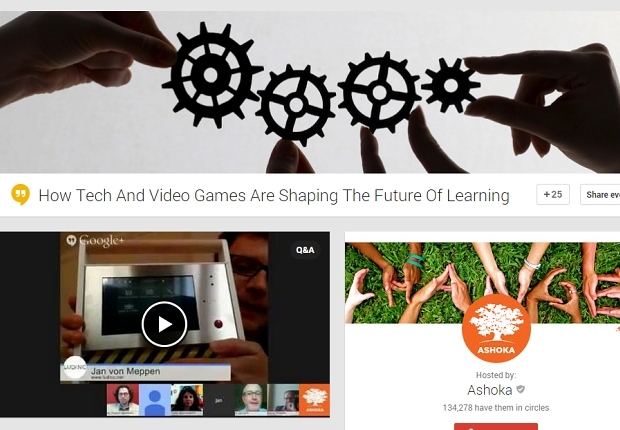 Yesterday I had the honour of hosting an online video discussion entitled ‘How Tech And Video Games Are Shaping The Future Of Learning’ for Ashoka and the LEGO Foundation. I’ll embed the video here and then say a bit more about it. Ashoka are pioneers in the field of social entrepreneurship, with a network of almost 3,000 Fellows in 70 countries providing a platform for innovative people dedicated to changing the world. They bring together entrepreneurial talent and new ideas to solve social problems. And the LEGO Foundation aims to change the world in a slightly different, but related, way, by catalyzing global discussion and action to provide the means, tools and knowledge to stimulate the natural urge to imagine, create, and learn. Yes! So, yesterday’s discussion was in the form of a Google Hangout, which is the best-that-I’ve-seen (not that I’ve studied it) free way of having an online video discussion with several people around the world, and you can live-stream it to anyone who wants to watch it at the time, and immediately afterwards it becomes available as a video on YouTube. → Jordan Shapiro: He writes for Forbes on education and technology, game-based learning, and parenting; and teaches at the College of Liberal Arts, Temple University, Philadelphia. → Jennifer Kotler Clarke: She is the Vice President of Research & Evaluation at Sesame Workshop, New York. → Bo Stjerne Thomsen: He’s the Director of Research and Learning at the LEGO Foundation. I co-wrote the Cultures of Creativity report with him. → Jan Von Meppen: He is overall game concept designer at LudInc, who make “immersive game experiences” to boost “engagement, motivation and learning” – including Professor S.
→ Jessica Berlinski: She’s the founder of If You Can, and now Chief Impact Officer of Adaptive Health Systems, a new company focused on social emotional learning games. → What is wrong with education today? → What’s the role of parents in relation to technology and video games, and how do we support our children to use them positively? → Isn’t it just better if children aren’t really using technology – isn’t it nicer to be playing outside with some sticks? → How can we put children at the actual centre of these debates about technology and learning? → What are the opportunities for creativity and making, which are so vital for us all? → How can we bridge the physical and the digital worlds? I enjoyed hosting it. I had to multi-task a bit – as in, actually multitask, rather than cycling between different tasks, which is what you do when you think you’re multitasking but you are not really – to pay attention to the conversation, and keep an eye on all the technical details working correctly, and get comments and thoughts from the simultaneous online chat and Twitter all at the same time. I managed it, but I do not think that a career as an airline pilot awaits. A big thank you to Marzena Zukowska of Ashoka Changemakers, who masterminded the session so well (and helped so I didn’t really need to be like an airline pilot), and all the other colleagues at Ashoka and the LEGO Foundation. We LOVED the Google Hangout on social and emotional learning in videogames today! Our 5th graders went crazy when the panel mentioned them and discussed their questions! Great authentic mentor learning. Thanks so much for that connection!